1. Supergoop! Sunscreen Mist SPF 50 - Sunscreen is a part of my daily routine, but it's especially important when I know I'm going to be outside for an extended period of time. I'm a huge fan of Supergoop! products, and this sunscreen mist is one of my favorites in their product line. Mists are my preferred way to use body sunscreen, because they're easy to use for on-the-go reapplication. This one is infused with antioxidants and has complete UVA/UVB protection. 2. HIKPRO Packable Backpack - I saw one of my girlfriends use this HIKPRO backpack months ago, and after she raved about how great it was, I knew I had to buy one for myself. I can't say enough great things about this backpack. I love the teal color and how it's roomy enough to fit everything I need for a long day. It's water resistant, sits comfortably on my shoulders, and packs up into a small, portable case. Best of all, it's only $20. 3. KIND PLUS Granola Bar - I'm one of those people that needs to have snacks with me at all times. This granola bar is one of my favorites if I'm going to be outside for a while, because it's portable and quite filling. Although I love all the KIND granola bars, this dark chocolate, cherry, and cashew flavor is my favorite. I love that it's sweet, tart, chewy, crunchy, and holds me over until a full meal. 4. GoPro Hero 3+ Silver Camera - My GoPro camera was gifted to me last year, and I've been using it non-stop ever since I received it. I love that I can go hands-free and capture the best video clips and pictures with its wide lens. It comes with lots of accessories, so I can choose what works best for the day's outdoor activities. 5. Hydro Flask Insulated Water Bottle - Staying hydrated is super important while being outside, especially in the Texas heat. This Hydro Flask is hands-down my favorite water bottle (also mentioned here). I've put ice inside the bottle in the morning, left it in the car in blazing Texas heat for a few hours, and by the end of the day, the bottle still had ice in it! It's easy to clean, and it never leaks on me. 6. Emblem Eyewear Sunnies - I can't justify purchasing expensive sunglasses, because I always end up breaking or losing them. Emblem Eyewear makes affordable and trendy sunglasses that are perfect for protecting my eyes while I'm out and about for the day. 7. Keen Hiking Boots - My hiking boots have been one of the best things I've brought with me to college. I love that these are comfortable, give proper support to my feet, and work well in cold and warm weather. They're not the cutest pair of shoes in the world, but they do what they're meant to do, and I am super happy they're with me here in Austin. 8. Eagle Nest Outfitters DoubleNest Hammock - I contemplated purchasing an ENO hammock for a few years, because I thought it would just be a phase (like when I wanted a Penny skateboard). I finally purchased one for myself after waiting long enough. There's nothing like sitting/laying down in a hammock when the weather is nice outside, so I'm really glad I have one now. This hammock packs up into the size of a grapefruit, and takes under five minutes to set up. I recommend this DoubleNest Hammock with the Atlas straps, because it makes the set up very easy. I've had this ENO hammock for over a year now, and I bring it with me on almost every outdoor trip, in case I get the chance to lay down and enjoy the scenery. Do you love being outdoors? 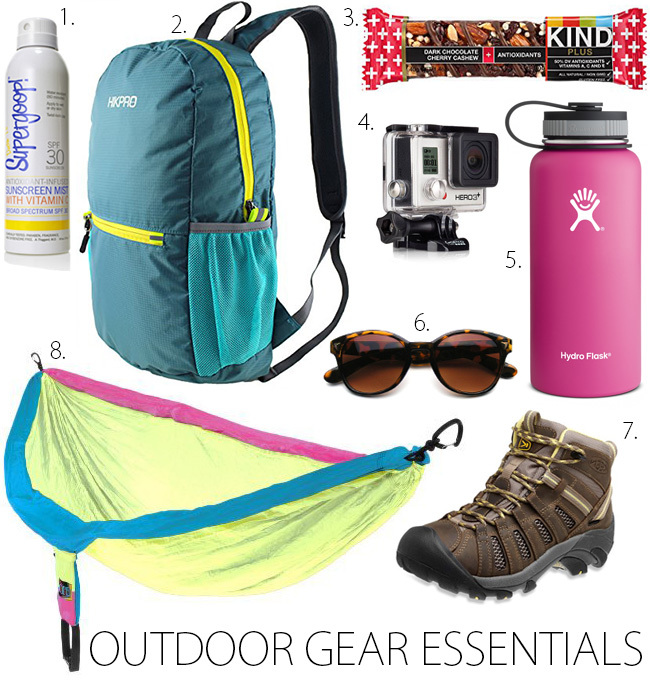 I would love to know your outdoor gear essentials! I have been wanting to get a hammock like that for the longest time, perfect for camping or even just reading outside! we were able to do some hiking on our last vacation and our gear has changed since having a little one!